Chris, this is a pretty obscure question, but your blog indicates that you’re a keyboard player so I’m hoping you have an answer. My 8-year-old synthesizer lost power during a gig last night and my custom programs were wiped out. Today I looked on the manufacturer’s website and see that a firmware update is available (which I hope will cure the problem), but it’s in the form of a MIDI file. How can I install this thing? And, is there anything I can do to back up my synth once it’s restored? Now this takes me back. 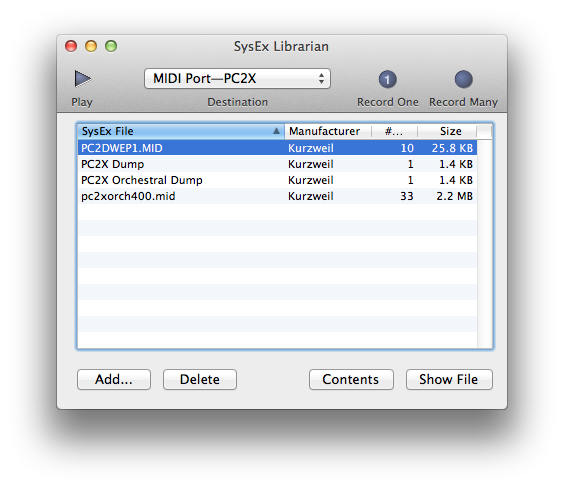 And it does because what you’ve encountered is a MIDI file full of system exclusive (SysEx) data. In the days before synthesizers had better ways to transfer information (such as a built-in USB port, for example) you had to move raw data between your synth and a computer over a MIDI connection—basically “playing” it from the synth and “recording” it on your Mac. Given your instrument’s age (and the nature of that firmware update file) I’m going to assume that this is the method you’ll use. Perhaps I’ve built this up as something that’s difficult to do. It’s not, really. You just require the right connections and gear. First, you’ll need a USB-to-MIDI interface (or a FireWire-to-MIDI interface). You can find these things for around $35 at music stores and online (see the image above). If the interface doesn’t come in the form of a cable (with a USB connector on one end and In and Out MIDI connectors on the other) you’ll need a couple of MIDI cables. You then need a software application that can transmit and receive SysEx data. All of today’s modern software sequencers and digital audio workstations (DAW) have this feature, though you may have to dig around a bit to find it. You then make your MIDI hardware connections, configure your synthesizer to accept the firmware update you’ve downloaded (on my synth I access this command through a Global setting), instruct your synth to keep an ear open for incoming data, and then, on your Mac, “play” the SysEx file so that the data in it transmits to your instrument. Hopefully that instrument shows the update’s progress and lets you know when it’s been completed successfully. That takes care of updating your instrument. Go ahead and configure your synth with the instrument settings and patches (instrument sounds) that you use when you perform. Once you’ve done this, fire up the application you used to transmit the SysEx data for the synth’s firmware update. This time, however, you’ll ask this application to capture—rather than transmit—the SysEx data coming from your instrument. There should be a command on your instrument that allows it to dump its settings via SysEx. Start the capture application recording and then push the appropriate button on your synthesizer to transmit the SysEx data. Stop recording in the application when the dump is complete. Now save that file as a MIDI file. When your synth next loses its mind (which I pray doesn't happen again), just reload its setups and sounds from this file. The free SysEx Librarian makes it easy to transfer SysEx data. Note: You don’t need to dash out and purchase an expensive DAW application to do this. SysEx Librarian is a free utility that can both capture and transmit SysEx data. I recently used it to install a firmware update on my Kurzweil PC2X synthesizer (and then backed up my performance settings from that keyboard to my Mac).